On my last visit to Toledo, it seemed holier than ever: Dark El Greco clouds threatened overhead, stark against bright, clear horizons. Hail pelted the masses of people clogging the streets as they awaited the Good Friday procession. A look back at my write-up reveals nothing but superlatives: Toledo's street plan is the most confusing in Spain, its cathedral the most Gothic (and the most Spanish of all Gothic churches), and the cathedral's altar the most stunning. 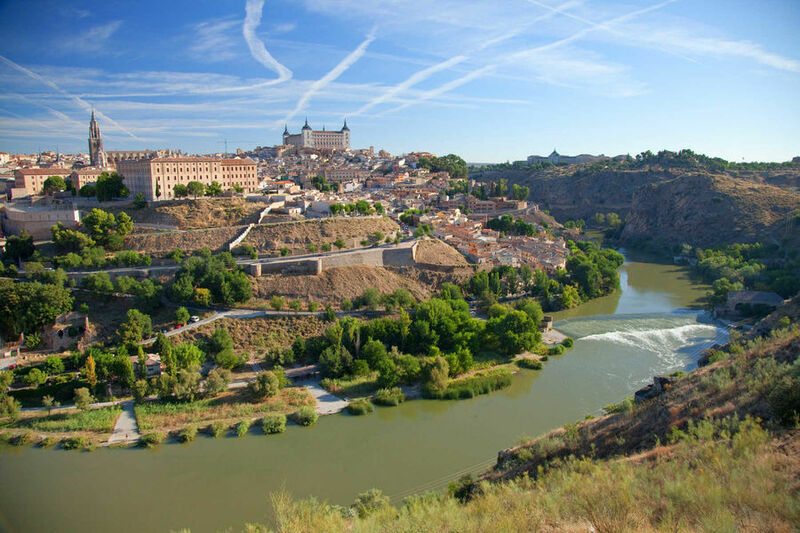 Toledo was once home to Europe's most powerful king, Charles V, and is papered with the vividly spiritual paintings of the city's most famous artist, El Greco. Spain's former capital crowds 2,500 years of tangled history onto a high, rocky perch protected on three sides by a natural moat, the Tajo River. Toledo is so well-preserved and packed with cultural wonder that city itself has been declared a national monument — no modern exteriors are allowed. For centuries, Christians, Muslims, and Jews enjoyed this city together. Toledo's past is a complex mix of these three great religions. Today Toledo is filled with tourists day-tripping from Madrid, a quick 30-minute train ride to the north. And its main sights were beautifully renovated just a few years ago when the town marked the 400th anniversary of El Greco's death. 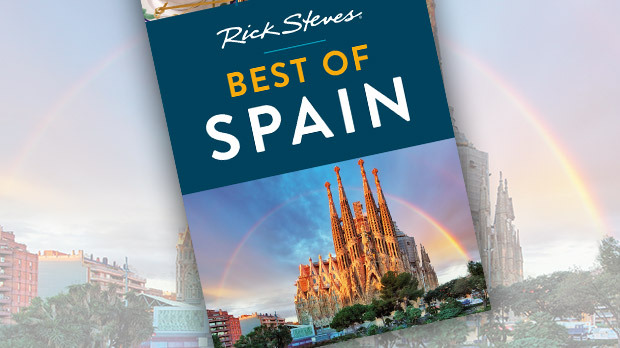 The two biggies are the magnificent cathedral, with a jaw-dropping interior and a sacristy swathed in El Greco's work, and the Santa Cruz Museum, with its own world-class collection of El Greco paintings. The cathedral is shoehorned into the old center, where its exterior rises brilliantly above the town's medieval clutter. The interior is laden with elaborate wrought-iron work, lavish wood carvings, and window after colorful window of 500-year-old stained glass. It's so lofty, rich, and vast that visitors wander around like Pez dispensers stuck open, whispering "Wow." Drifting among the pillars, it's easy to imagine a time when the light bulbs were candles and the tourists were pilgrims — when every window provided spiritual as well as physical light. The cathedral's spectacular altar — real gold on wood, by Flemish, French, and local artists — is one of the country's best pieces of Gothic art. The complex composition shows the story of Jesus' life, conveying the Christian message of salvation. 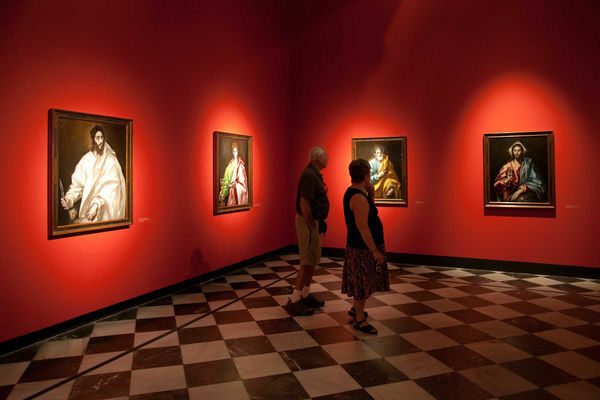 The cathedral's sacristy is a mini-Prado, with masterpieces by the likes of Francisco de Goya, Titian, Peter Paul Rubens, Diego Velázquez, Caravaggio, and Giovanni Bellini, not to mention 18 El Grecos. Born in Greece and trained in Venice, Domenikos Theotocopoulos (tongue-tied friends just called him "The Greek"…El Greco) came to Spain to get work as a painter. He found employment in Toledo, where he developed his unique painting style, mixing icon-like faces from his Greek homeland, bold color, and twisting poses from his time in Italy, and almost mystical spirituality from Catholic Spain. Toledo's Santa Cruz Museum, now completely open after years of renovation, holds a superb collection of El Greco paintings, including the impressive altarpiece Assumption of Mary. Finished one year before El Greco's death, it's the culmination of his inimitable style, combining all his signature elements to express an other-worldly event. No painter before or since has captured the supernatural world better than El Greco. True El-Grecophiles will also want to visit the small El Greco Museum, built near the site of El Greco's house. It's worth a stop if only to see El Greco's panoramic map of the city as it appeared in 1614 (commissioned to promote Toledo after the king moved to Madrid and the city was no longer Spain's capital). A day full of El Greco and the romance of Toledo after dark puts me in the mood for game and other traditional cuisine. Typical Toledo dishes include partridge (perdiz), venison (venado), wild boar (jabali), roast suckling pig (cochinillo asado), or baby lamb (cordero — similarly roasted after a few weeks of mother's milk). Plaza de Zocodover is busy with eateries serving edible food at affordable prices, and its people-watching scene is great. But it's worth a few extra minutes — and the navigating challenge — to explore Toledo's side streets and find places where you'll be eating with locals as well as tourists. After dinner, I like to enjoy a tasty left-over from Toledo's Moorish days, almond-fruity mazapán. Shops all over town sell mazapán goodies in ready-made gift boxes, but I prefer to select my own. For a sweet and romantic evening finale, I pick up a few pastries and find a bench on the Plaza del Ayuntamiento. The fountain burbles to my right, Spain's best-looking City Hall is at my back, and before me is her top cathedral — built back when Toledo was Spain's capital, and still shining brightly against the black night sky.